Baffling remake of the 80s and 90s daytime classic now in its fifth reincarnation, truly making it the Annie Wilkes of gameshows. At least they’ve upped the money to £20 a question rather than cheekily keeping it a fiver like the last iteration. This new version features Dara O’Briain (because of course it does), attention seeking sixth-formers and “millennial humour”. Doubtless an ironic handjive as well. If this brings in a young audience then good for them. Do you know I’m 37 these days? I can’t keep doing this. Amusingly I won’t get to watch this live because Comedy Central isn’t on Freeview. All the technology in front of me, and yet the only way to legally watch seems to be to pay an alarming amount to cable/satellite.. Yes it is. I’m trying to hold out for when Game of Thrones starts, although I’m thinking about jacking in my Netflix sub soon. …. but I’m not doing it for Blockbusters!! If there were ANYTHING else I could name, on Sky, which I would actually watch, then maybe. But right now, nah. I’m alright with Netflix and Amazon Prime for the meantime. Because Blockbusters is boring and everyone keeps bringing it back, under the impression “it’ll be DIFFERENT this time” and it never takes off. I personally disagree that Blockbusters is boring and have a lot of love for the format; but I do agree with your point on trying to be different and falling flat. Challenge’s version was in my opinion the only revival done well, precisely because they went to so much effort to take the original spirit and essence of the show and remain faithful to it while still giving it the necessary lick of modern paint. I would happily have watched further series (and indeed I have seen evidence to suggest Challenge had originally intended to do a Comedy Central and broadcast the 41 episodes as two series, but changed plan late in the day). I have no doubt that production-wise Blockbusters will be fine. The idea that the kids are going to put down Apex Legends to watch it is quite sweet. 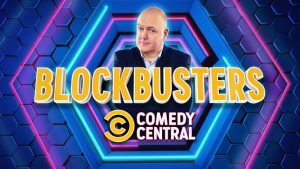 Challenge Blockbusters ended because nobody watched it, like all the other versions. I have no idea of the criteria Comedy Central have to judge it a success or not and I wish them best of luck. We had a science teacher who used an implementation of it for an end-of-term quiz. Running on a battered old 48k Speccy in 1992ish. It didn’t have hexagons (visually, in gameplay terms they still were)- I assume because they were a little more complex to implement than the staggered squares he used instead. Comedy Central have been releasing teaser clips on their YouTube channel and I’m a lot less pessimistic than I was. I think I’d be kidding myself if I said it’ll be the finest reboot of the format – Challenge’s 2012 attempt wins that hands down in my opinion – but I’m willing to give it a go as it’s my all-time favourite quiz show. Having attended one of the episodes, it was very entertaining but of course reducing it to 25 minutes-ish may lose some of Dara’s gags. The adverts make it seem as though the contestants are somewhat dim, but the players we saw were pretty sharp. Well worth a watch. – Last night’s 8pm slot on Comedy Central (a new episode of Your Face or Mine) brought in 102k viewers. – Last week’s Thursday 8pm slot (a repeat of Friends) had 33k viewers. Very interesting, thanks. I note that YFoM is going out after Blockbusters as well. Oh my god what a trainwreck of a show. Audience laughing every 30 seconds often at nothing. What the hell is that weird hexagon stand off round? Why does the Gold Run need a question theme? It’s like it’s been put together by somebody that has never seen Blockbusters and does not understand comedy. Well, it’s generally enjoyable, pretty funny thanks to Dara, though the constant generation clash humour just makes me think they should’ve booked a younger host. As is always the way these days, gameplay is slower so that we get to know more about the contestants – or in this case, the jokes – and losing the rollover format of previous incarnations means there’s only time for two rounds and a Gold Run each episode. The tie break round, if needed, is called the Hexican Standoff, which is cute, but it’s very unfair because the team of two has a clear advantage over the single player. Incidentally, I don’t think Bob Holness ever said “hexagon” in the classic original, but Dara and I think Simon Mayo said it constantly. It doesn’t sound right. The questions are very much in keeping with the original format, in both difficulty level and mixture of styles, so that’s technically good, but for me that’s always been the thing that’s made Blockbusters a bit too gentle to be a must-watch. Mayo referred to ‘hexels’ (hexcells?) a few times. – Only 2 rounds are played. If there’s a tie, there’s a one question shootout (called the ‘Hexagon Standoff’) – a wrong answer here means the other team win by default. – Consolation prizes are a hoodie and a reusable water cup. – No carry over champions. I have a huge issue with the Hexagon Standoff round. It’s been done to keep the show to time so no contestants carry over I get that. But to me it feels wrong, out of place and a cheap way to win. The game elements in this version feel very on the back burner in favour of stupidity. I am not sure if the contestants have been told to buzz in with stupid answers or that double team were just doing it for laughs. To me, it feels like neither one thing or another. There’s been a run of shows that have reinvented the format in a loose way (Mr & Mrs, EOOTCD Countdown, Through the Keyhole etc.) and done so successfully. And, even though they took 5 of their 23 minutes to get to Question 1, it still doesn’t feel quite loose enough. The tiebreak is a mis-step – surely a 2×3 grid could’ve worked? The first ever Michael Aspel episode has been uploaded to YouTube this evening. For those of us that don’t have cable or satellite: did they butcher the title theme? And if the winners lost the Gold Run, did they keep the losing fanfare for that? No losing horn, and the theme tune was butchered compared to the preview videos. About the same length as the Mayo version. Comedy Central’s theme is a very faithful recreation of the original theme tune, even managing to accurately recreate the ending (instead of erroneously going straight into the final four-note sting like in many other revivals); though the full theme is only used during the end credits – the title sequence uses a very condensed version; and the contestant introductions shortened still. The endgame has a quiet “think music” throughout the entire 60 seconds which is influenced by the theme – you can actually hear some of the same stings – but there is no losing horn, which is a shame. I liked parts of it – the increased prize money was a nice touch, Dara is clearly having a ball, the set is actually pretty nice in its intimacy, announcing the Gold Run prize BEFORE they undertake it is a neat change of pace and I love the fact they still have the end game animation with the hexagons going different colours! I don’t even mind the episodes being self contained instead of straddling! However, there were parts I wasn’t so keen on – the gag prizes on certain questions seem out of place, the board is no longer fully tessellated (nerdy I know but that’s the guy I am! ), whoever came up with the title ‘Hexican Stand-Off’ wants sacking and the choice of categories in the Gold Run seems unnecessary! It could’ve been A LOT worse though – they could have put it on after the watershed and everyone could’ve been effing and jeffing all over the shop. Thankfully, the humour is clean and friendly – we’re laughing with them, not at them! Was an enjoyable half hour. Understand why they’ve introduced the tie break to keep them as self contained episodes. Nice they’ve gone back to younger contestants – still think it’s on the wrong channel though. 110k for episode two last night, so an upward trend. Impressive, given I don’t think there was any buzz about it. It’s the most first-world and modern of problems to complain that full episodes of a show aren’t available through official routes on demand, isn’t it? They’re on the Now TV entertainment pass, if that’s your “thing”. Is it just my awful memory or have they also reversed the buzzer sounds too? Always remember the higher tone sound being for the single player. Three weeks in and it’s a celeb special tonight with Britain’s Got Talent judges. Who are also, shock horror, on the Thames/Freemantle payroll. 103k for the celeb special – down on last week; incidentally I noticed some Tube screen ads for the show this week, so CC continuing to push it. I’ve no idea what sort of figure they’d be happy with. You certainly can’t say they’re not trying. Should have been C5 from the start really. The question is what timeslot and day would work best in favour of the ratings. The channel which posted that also has a dangerously high quantity of old Bullseye episodes. I did enjoy seeing the slightly festive version of the opening credits. As we’ve been tracking the ratings, 66k this week – probably in ‘don’t bother recommissioning’ territory. I reckon some other channel will recommission it just in time for the show 40th Anniversary on British TV in 2023!